I recently started putting together a list of summer songs for an event I'm planning and I loaded in one of the great songs from the 1960's, "Summer in the City" by the Lovin' Spoonful. What a dumb name for a group?! Seriously, think about? The Lovin' Spoonful? Great song though and it made me think how alive we all become with 70 degree plus temperatures, flowers in bloom, trees that are spread to their full green and grills that wrap themselves around our neighborhoods with the most delightful of scents. One of the other great joys of summer? Our various communities come alive with all types of events, festivals, concerts and whatever else they can pack into the hazy, lazy days of summer. Last night I took my senior mom to the Palos Park Village Green to hear the Ron Smolen Orchestra. That's right! A ten man orchestra that plays big band, 1940's, World War II music. I love music, so I gravitate toward anything that is good and if you know anything about music you have to love the big bands from the Depression/WWII era. The Knights of Columbus assembled this evening filled with commercials, public service announcements, news updates and music from another time and in many ways from another place. 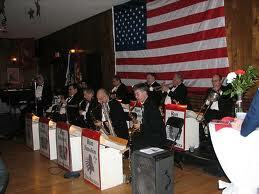 They called their night, "Big Band Ballroom Radio Broadcast." I was one of the younger members of the audience, but much to my delight there were people younger than me in the group assembled on a chilly summer night in the Midwest. The Ron Smolen Orchestra features a ten man band of guys ranging in age from 70something (he wouldn't exactly say how old he was, but he admits to being born in the 1930's) to a youngster who comes in at the age of 41. They were terrific. They played the hits of Benny Goodman, Bing Crosby (not a band, but hey, he was Bing), Wayne King, Lawrence Welk, Frankie Yankovic and a couple from Glenn Miller. How on earth can you not love "String of Pearls" and "In the Mood?" Enjoy your summers, but take advantage of all of the events that pop up across the country during these lovely three months smack dab in the middle of our calendar. Life is brief and fragile, so enjoy your lives, families, friends and your communities. There's a whole lot going on in our realities and sometimes you experience something that is downright memorable. My mom loves this music and I will always remember her smile upon hearing this local orchestra playing the opening chords to Glenn Miller's "String of Pearls." Judith, Thank You for the great review. Mr. Smolen, How nice that you found the post on your orchestra's perfomance. I had never heard of your group prior to my mother and I walking into the venue. Again, it was a wonderful night listening to the music. This post has had lots of pageviews, so a lot of people have seen it. All good wishes.